FTC disclosure: just FYI, some of the links here are affiliate links. That means that if you buy something through that link, I get a small commission at no extra cost to you. However, my opinion has not been altered at all because of this, and I do genuinely recommend these products. Anyway, thank you for supporting Our Journey in Journals!! This is my (mostly) completed monthly spread from last month. The month isn't over yet, but since it is so close to the end, there probably won't be anything else that I'll need to add to it. Anyway, I really like how this looks. 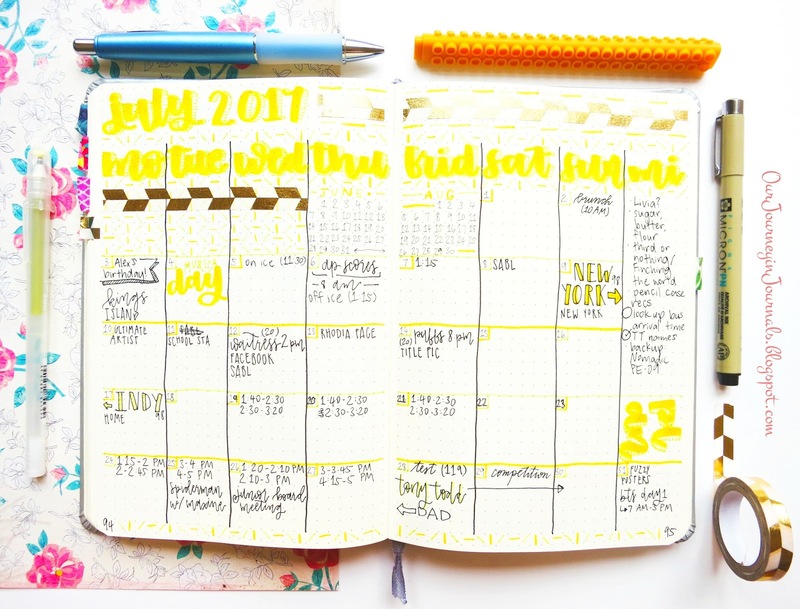 Of course, it also worked well function wise, but in July, my monthly layout, compared to other months, was especially pretty! In my opinion, at least. Because of summer break, I've had more time to work on my bullet journal for purely aesthetic reasons. Alas, since school is starting soon, next month will probably be simpler/more minimal. 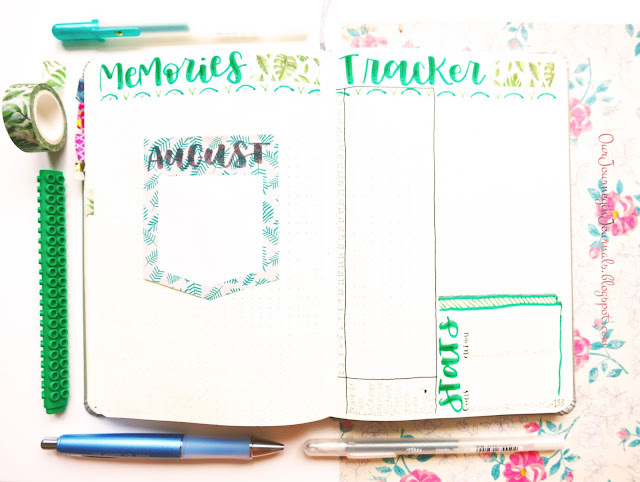 The other two spreads I include in my monthly bullet journal setup is a habit tracker and monthly memories spread. Of course, since the month isn't over yet, neither of them are yet to be finished. However, I do have my June monthly memories spread done. It was a pretty exciting month for me, and I really do like how the spread came out. I personally don't like sketching out spreads in pencil beforehand, so a piece of advice to automatically make spreads look more put together is to stick with a cohesive color scheme. Speaking of cohesive color schemes, here is my August 2017 bullet journal monthly spread! I went with a green and silver theme using a green Artline Stix brush marker, a green Sakura Glaze gel pen (color #829), a silver Sakura Gelly Roll Stardust gel pen (color #744), and some leafy washi tape (use the coupon code for OURJOURNEY for 10% off!). I personally love how this spread turned out! I especially like the mixed script sort of type that I used, which is something that I had been experimenting with this past month. Anyway, I decided to use this particular color scheme because I was making one of my friends tell me different ideas for colors I should use for August's setup, and she came up with this Slytherin-inspired one. It's actually perfect because I'm a Slytherin myself, and this is my birthday month (8/31)! The notebook I'm using is an A5 dot grid Rhodia Webnotebook (review here), as I have been doing for the past year - literally a year now since I started using my first one in the August 2016. I think I have two months left in this particular notebook, so I'll probably be setting up a new bujo next October. Here is my setup for the August habit tracker and monthly memories layouts. I actually flip flopped the placement of these two spreads, which you might've noticed if you've seen my past monthly bujo setups. Anyhow, I got that sticky note from a pad of sticky notes from the Target dollar spot (an amazing place BTW), and it happens to match quite well to the rest of August's theme. I use it to record the important events throughout the month as they occur, so I know what I want to include in my monthly memories layout. That's really the only sort of planning I do for that spread. Like I mentioned earlier, I'm going back to school on August 8th. Ahh!! I can't believe the summer is almost over, and I haven't done all of the things that I planned to do. 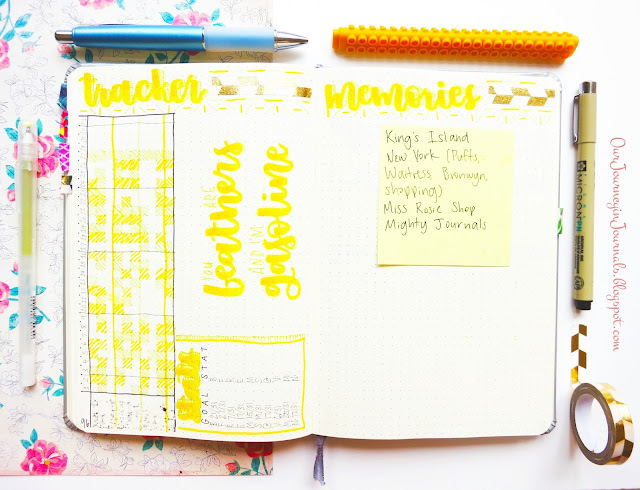 Nonetheless, school still approaches, so I've created some spreads in my bullet journal to help prepare for going back to school. 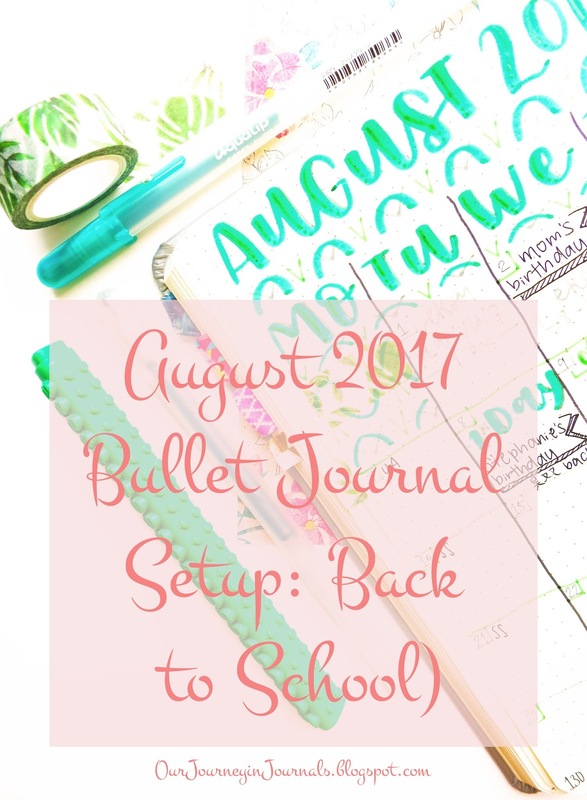 I have this school supplies list to help me curb my stationery spending, an updated bell schedule since my school is starting later next year, etc. 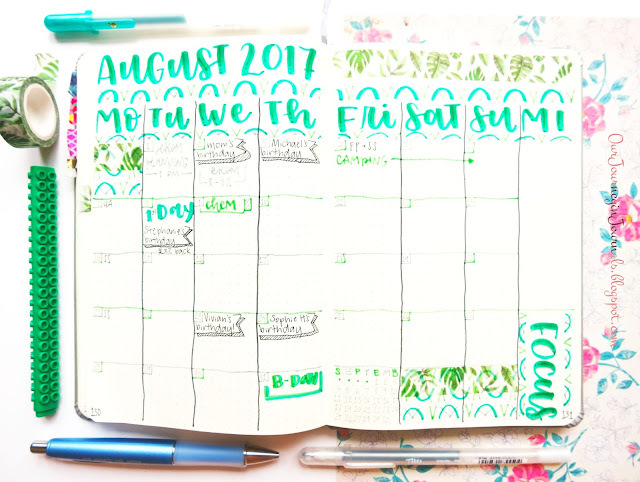 I also plan on making a spread for the school year with both my academic and non-academic goals. So that was my August bullet journal setup! I hope you enjoyed seeing it and that it inspired you with your own bujo. Are you going back to school? If so, when? Let us all know!